Since federal, state and local tax laws are so complex, many people find that professional assistance is a necessity. The CPA’s role in estate planning goes far beyond a straightforward financial analysis. An Employee Stock Ownership Plan (ESOP) offers compelling benefits to selling owners, companies and employees. A sound financial system is essential in providing reliable information on which to base informed decisions. As a small business owner, the two primary questions that you have are how much money is my company making and how much will I have to pay in taxes? We offer monthly, quarterly or annual accounting services to businesses. 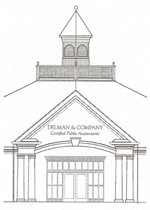 Delman & Company Certified Public Accountants is a public accounting firm located in Greensboro, NC. Since our beginning in 1977, our primary goal has been to provide clients with the very best in accounting services. Whether yours is a simple question or a complex problem, we're available. At Delman & Company, we're concerned about our clients' welfare and we're committed to helping them by providing all facets of quality and timely accounting services. Historically, the role of the CPA has been to prepare taxes at the end of the year. While tax preparation is still an integral part of the accounting function, more complicated financial matters have expanded the CPA's role. Individuals now seek professional advice year round. Delman & Company provides competent assistance and sound advice in the areas of taxes, accounting and management advisory services. 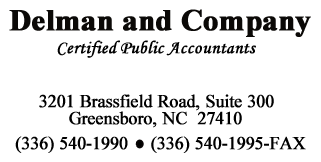 Delman and Company serves a wide variety of clients throughout the area. While we work for a number of businesses, professions, groups and individuals, we are concentrated in the areas of professional services, contractors, retail and service oriented businesses as well as not-for-profit organizations. We are not limited in the client base we serve, but do consider ourselves particularly skilled and knowledgeable in these areas. 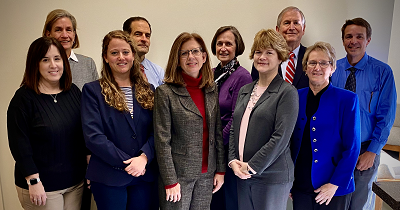 While Delman & Company Certified Public Accountants realizes the importance of working with clients on a one-to-one basis, we also value and emphasize teamwork. Our clients enjoy the benefits of the shared knowledge and resources of our entire staff. In other words, Delman & Company Certified Public Accountants clients have the best of both worlds - the personal attention of a partner and the collective expertise of our entire staff. Delman & Company Certified Public Accountants have come a long way in over thirty years of service. We measure our success in terms of our clients' success. Since your success tomorrow depends upon your plans today, let Delman & Company Certified Public Accountants help you plan your tomorrow . . . today! It’s not just about how much you earn, but about how much of what you earn you are actually able to KEEP! Using a CPA firm to prepare your income tax return enables you to take advantage of all possible deductions and tax credits for which you and your family are entitled. What Business Structure has the Most Tax Advantages for You? Choosing the right legal structure is one of the first, and most important, decisions a new business owner makes. Each structure, whether a sole proprietorship, limited liability corporation (LLC) or one of the other entity choices, holds different legal and tax implications. Let Delman & Company help you plan your tomorrow...today!! Using a CPA firm to prepare your income tax return enables you to take advantage of all possible deductions and tax credits for which you and your family are entitled. Tax law changes on a daily basis and some of the changes not only affect future deductions and income, but are effective retroactively. Therefore, being familiar with your situation enables us to not only take advantage of changes and deductions that you may qualify for on future income tax returns, but also we can prepare an amended return for you if a law is enacted retroactively and it applies to you. That is just one of the many advantages of using a CPA firm to prepare your income tax returns. We can help you navigate through today’s complex world of ever changing tax law to your maximum benefit. Paper Work and Costs • What kind of activity is the business engaged in, e.g. manufacturing, food service, tree trimming, etc.? • How many people will work in the business, including you? • How much money do you have to invest in starting up a company? The simplest, least expensive business structure is the sole proprietorship There’s no need to pay any fees or file special paperwork. LLCs and corporations can cost up to $800 to establish and require officers and detailed record keeping. Risks and Liabilities • To what extent do you want to limit personal liability for business debts and liabilities? For example, if you need maximum protection from personal liability, then a corporation or LLC may be warranted. In some cases, reasonably priced insurance policies can cover liabilities, thus making a sole proprietorship the way to go. • Do you anticipate losses early-on in the business? If yes, you may benefit from a pass-through entity such as an S-Corporation, partnership or LLC. • Will the majority of earnings come from owner-employees who also want to maximize the purchase of fringe benefits with pre-tax dollars? If yes, you may benefit most from a C-corporation, which allows offset of corporate deductions for salaries. Consideration of both federal and state tax law, especially in closely held entities where the combined tax liabilities of all parties are significant, is integral to our process with you. We analyze the comparative advantages and disadvantages of each entity as it relates to your situation. Income Taxes • What is your current tax liability? • Will you have excessive business expenses or not? • What level of salary is reasonable for the type of work you are doing? Your income is taxed based on the business structure. For example, sole proprietorships, partnerships and S corporations are "pass-through" tax entities. All the profits and losses pass through the business to the owners. They must report or deduct their profit on the personal income tax return. C Corporation owners do not report their shares of corporate profits on their personal tax returns. Instead, they pay taxes on profits received in the form of salaries, bonuses, and dividends. The first $50,000 of corporate income is taxed at a lower rate than most individuals. What Types of Business Structures Exist? Your Delman and Company partner will meet with you to begin the process of establishing your business structure and a relationship designed to ensure you spend less time on paper work and more time in your business. Call us today at 336-540-1990.